The unceasing ebb and flow of the ocean echoes the shifting tides of life. Calm one moment and turbulent the next, the waters may bring the unexpected, but they always crash on the same familiar shore. Capturing the multifaceted sentiment that there is unsung beauty in life's imperfect and unpredictable tides, Emilie Shapiro's jewelry collection features generous hunks of lovely yet rough-hewn aquamarine. Each stone is framed by a hand-sculpted brass bezel on a gold-filled wire. Handmade in New York. Make it a set! Pair it with the matching necklace and bracelet. Georgeous, unique, high quality earrings. I bought these fro my teenage duaghter who has started wearing all kinds of earrings. Her birthstone in aqumarine :) It's hard to find nice (and affordable) aquamarine jewelry, it's not common. I loved these especially because they are uncut! Fit's my daughter's casual style perfectly. I love the originality of the earrings. My daughter was very happy with the gift. 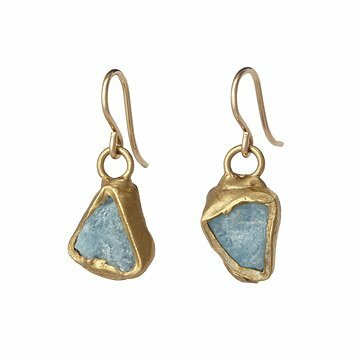 Emilie Shapiro's jewelry collection features generous hunks of lovely yet rough-hewn aquamarine.